Learning how to order drinks at a bar doesn’t have to be a painful process. Sometimes, however, just trying to figure out what to order at a bar can be a bit of a process if you’ve never been to a bar before, you don’t go out clubbing, don’t drink too often etc. 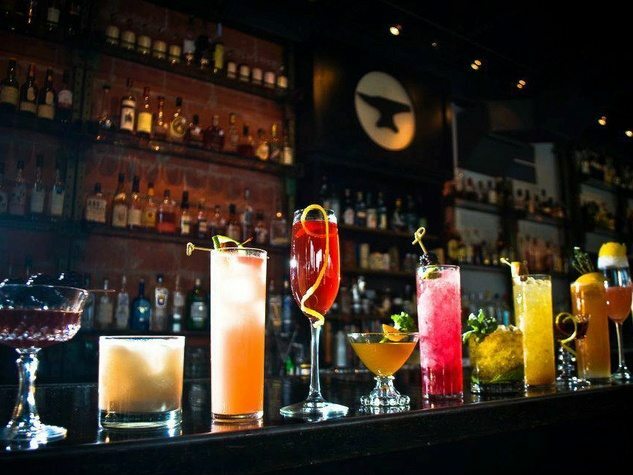 There is a right and wrong way to order drinks at the bar and the benefits of knowing how to order drinks at a bar are that you will get quicker service, the bartenders will be friendlier towards you and you won’t look like a schmuck in front of your friends and the other club goers. We’ll start off with a list of the things that you should do when ordering drinks at a bar and then we’ll finish with some humorous videos on how NOT to order drinks in a bar. Problem it Causes: Let’s say you want a Vodka and Coke, a Gin and Tonic and a Vodka Redbull but you order like this: “I’ll have a Coke Vodka, Tonic Water and Gin, Vodka and Redbull”. The bartender could mistake this for a glass of Coke, Vodka & Tonic and a Gin & Vodka with Redbull. Just like you should name the liquor first, if you prefer a specific brand of liquor over another, make sure you name that brand first. Problem it Causes: Lets say you like a particular brand of Vodka, like Grey Goose. So you order like this: “I’ll have a Vodka Martini, Grey Goose and Cranberry Juice. What you actually want is a Grey Goose Martini and a plain cranberry juice. What you’ll get is a Vodka martini made with whatever vodka is on the rail in that particular bar (the cheaper stuff) and a Grey Goose and Cranberry juice. Well or Rail Drink – the well or rail is the area of a bartender’s station where they store the most commonly ordered alcohols – typically vodka, gin, rum, scotch and maybe tequila and rye. These cheaper alcohols are the ones you’ll be served if you don’t specify a particular brand. Call Drink – a call drink refers to any drink where you “call” or name the brand of alcohol you want. Premium or Top Shelf Drink – premium or top shelf drinks refers to the most expensive brand of a particular alcohol that a bar carries. Keep in mind that each bar carries different alcohols on their rail. One bar may use Bacardi rum on their rail where, in another bar, it is a call drink and thus more expensive. If you are unsure and prefer a particular brand of alcohol, ask the bartender whether your particular brand is a well drink or a premium drink. Draft beer is any beer that is pulled from a tap and comes from a keg. If you want a draft beer, you’ll need to make sure that you order it as a draft beer. And since some bars carry two sizes of draft beer – typically a pint (20oz) and a half pint (10-12oz), you’ll need to specify what size you want else you’ll likely end up with the larger size. And, if you don’t specify that you want draft, you’ll get a bottle of beer. When you order a glass of wine from the bartender and they ask you if their house wine is ok, what they are referring to is not wine that they make in-house. But rather, its the wine that that particular establishment has chosen to have as their “well” wine – the wine they serve by the glass to their customers who don’t order a specific bottle. Just because its their house wine doesn’t necessarily mean that it is of low quality. Some bars, pubs or clubs use higher end wines as their house wines and may or may not carry other bottles of wine that customers could order ‘by the bottle’. If you travel often and get to sample drinks in various parts of the country and various countries around the world, what you’ll find is that if you order a drink in the States, the same drink in Canada and then again somewhere in Europe, you’ll likely find that they are made differently. Not only is the same drink made differently in other parts of the country or world, but different bartenders working in the same bar may make them differently (though bartenders in the same establishment should be making drinks the same). Just because you had a Cosmopolitan martini in one place where it was made with just vodka, triple sec and cranberry juice, doesn’t mean that you’ll get it the same way in the next bar. Some bartenders add a little lime bar mix or a splash of soda water to their Cosmos. Therefore, if you like a drink a certain way, then make sure to mention to the bartender that you’d like it made that way. Then you’re guaranteed to have the exact same drink each time.To prove this point, go find 3 different cocktail recipe books and compare the recipes. Or, even quicker, do a search on Google and count the variety of different ways the same cocktail can be made. 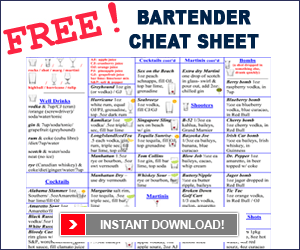 There are very few cocktails that are made the same way by every bartender around the world.In addition to the above, there are many other bartender terms or bartending lingo that you may need to know if you like your drink a certain way. Click here for our Bar Terms page to find the rest of the lingo used at the bar. Although the following videos are meant to be a little ‘tongue in cheek’ funny, they represent real situations that happen with customers at every bar around the world. Remember that we’re not hating on you for being this guy or girl, we’re just trying to educate you on how to order drinks at a bar properly so that you and the bartenders can have an enjoyable night.